For the rest of the year we are going to attempt to do something we have never done in the history of this blog that started in 2010- post daily. Over the years we have amassed a great deal of really good content, some of which are commissioned and published pieces that we have contributed to magazines and other projects. Others are posts that have been waiting in queue to make it to the blog- eureka! Plus there are so many great timeless published posts that you have not seen, hidden in the recesses of the blog that we simply have to re-share. The fact is, we really miss you and your interaction and we aim to flood your timeline with really great content. Today, we will share one of a series of recipes we were commissioned to create and shoot for Dubai’s Food eMag DXB last year for their new year’s issue. We will share two more over the next two days. These are perfect for the Christmas and New Year’s Holiday season so be sure to print them and do them. Be sure to pin this post for later use. Please also follow us and tag us on Instagram, Twitter, and Facebook to share your take on our recipes as well. There is always roast on the Jamaican holiday table. 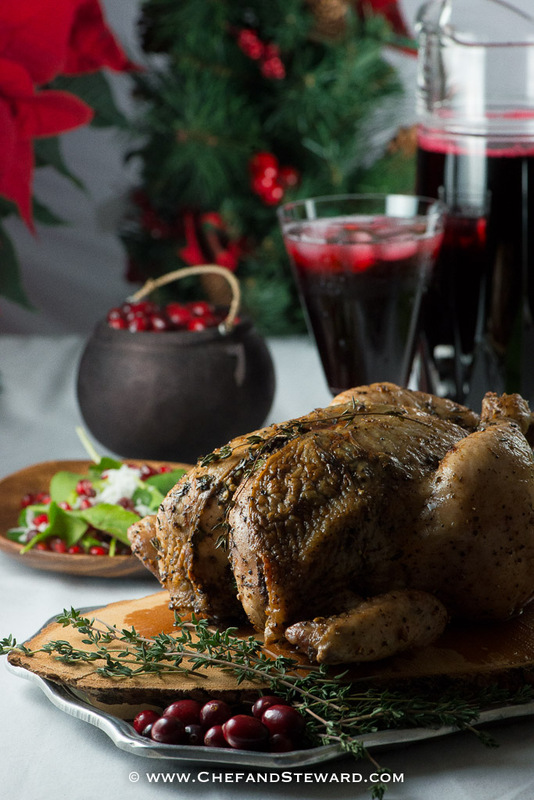 Whether it be roast beef, pork or chicken, there is something very festive about a whole piece of meat or poultry oozing with the spicy aromatic flavours that our cuisine is known for. The secret here is using only fresh herbs and freshly grinding your spices for the most sensational flavours. Here is a great recipe to adorn your table and please your palate. My house, though nestled in the sandy dunes of Arabia, has the smell of a tropical Jamaican Christmas and New Year wafting through the air. As a child of the tropics and Jamaican expatriate, food is my home away from home. In an instant, a smell, a taste, a sighting of a traditional ingredient or any combination of the above transforms my little Middle Eastern Villa into an idyllic tropical getaway. For this first edition of Food eMag DXB for 2016, I am thrilled to share three recipes with you that I have created so that you can join me on my little island foodie holiday paradise. The recipes are quick, practical and call for ingredients that are readily available in the region. As a rule, I favour recipes that make for efficient use of energy and resources. In other words, less time in the kitchen and more time enjoying the company of your family and friends. Traditionally, every Jamaican home has a roast of sorts, a sangria cocktail we call “Sorrel” and coconut in some recipe (usually in Rice and Peas). Here is my take on the representation of those three flavours- the roast, the sorrel and the coconut. Not surprisingly, allspice -a spice native to Jamaica- features prominently in two of these recipes! No surprise here for this is the queen of all spices and no Jamaican home is ever without it. In fact, a Jamaican home without allspice is like a sailboat without sails. Join us tomorrow for more mouth watering Jamaican dishes. Until then, see recipe below. Please leave a comment and share this post. 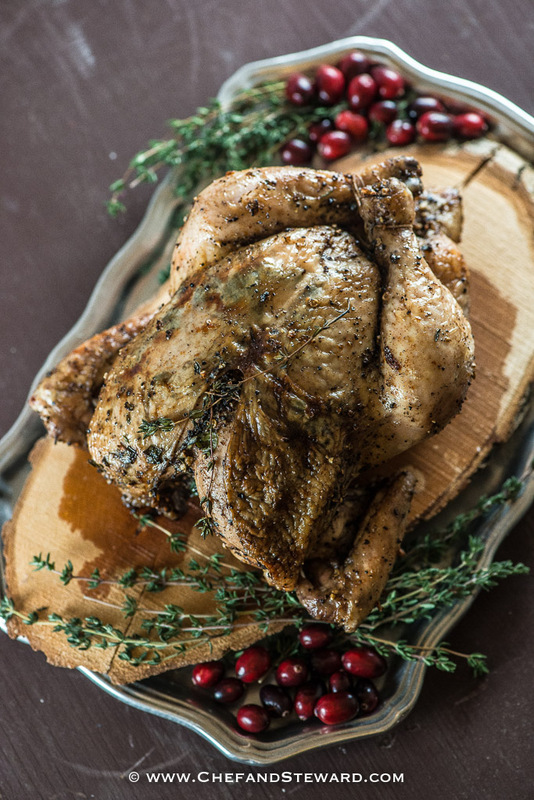 Bring the Caribbean to your holiday table with this succulent, scrumptious Jamaican Roast Chicken recipe for Christmas, New Year's and beyond. Finely dice the garlic and strip thyme leaves from stems and combine with black pepper, allspice, scotch bonnet/habanero, salt, oil, vinegar and mix in a small bowl. Thinly slice the green parts of the stems of the green onions and set aside. Rub the spice paste all over chicken, getting into every nook and cranny and the cavities as well as the neck area. Gently ease skin away from chicken in the breast and back areas and rub marinade underneath. Tuck the sliced green onions under the skin as well. Place the white stems of the green onions along with the stems of the thyme inside the cavity. Truss the legs together with kitchen twine. Tuck the wing tips underneath the back of the chicken so that the chicken will present nicely on the table when done. Marinate for at least 2 hours, but overnight is best. Bring the chicken to room temperature before cooking. When ready to cook, preheat oven to 180C. Roast chicken for an hour, then crank up the oven to 220 for another 5-minutes to brown. Allow chicken to rest for at least 10 minutes before cutting. Present it whole at the table and carve tableside for extra fanfare. Jamaican Sorrel Drink- the PERFECT Christmas cocktail! As much as I love heat I can’t believe I’ve never thought to make my chicken spicy! This looks delicious. I’m lucky if I manage to post more than once a week so good for you going for every day! Happy holidays. Melinda, this isn’t hot in the heat department, though you can definitely make it more so. It is spicy from the spices and herbs as well as the bit of scotch bonnet pepper. This looks mouth watering, I bet this taste as good as it looks. 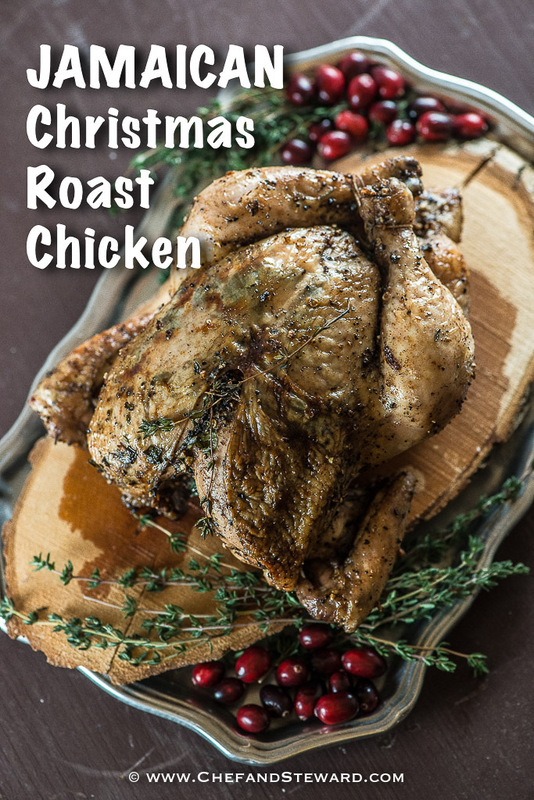 Will have to copy this recipe and try it for Christmas dinner. Thank you so much for sharing this awesome recipe. Crisly, Thanks so much for your feedback. It is really juicy and delicious and I hope you like it! It looks juicy indeed. You just make me crave for it ?. Thank you for sharing. This looks like such a gorgeous and delicious chicken! I love the wat you have plated it up – lovely presentation!! Yummy and flavorful and your photos are gorgeous! I used to always make chicken for Thanksgiving. I made turkey last year though. I think I like chicken better so I will be using chicken again this year! Saving this recipe. I may have to make it for the holdiays! This chicken looks delicious! What a beautiful spin on the roast chicken!! The pictures are lovely! This looks really good! I want to try out your recipe. This looks delicious! I love all the different seasonings! This looks delicious and beautiful. I love the flavor combination!